Thanks. I know how to do that, just not sure about the .rar file. Hmmm, you're going to need to unzip it (check out this article for some tips and links to various file compression programs). Alternatively, I believe @Waj may be able to lend a hand. Discord the App worked, but every time I wanted to join game night, the invite wouldn't work. I need help! 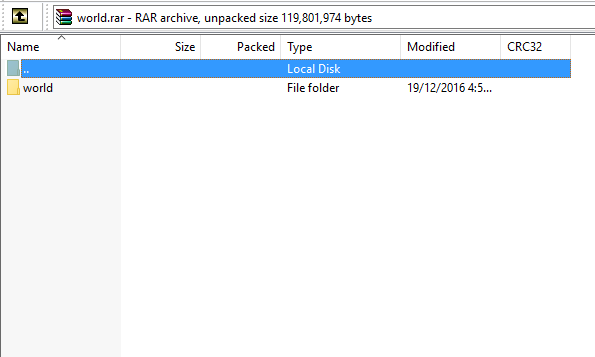 I am on a Windows device and I can't get the map to download/open it's stuck as a .RAR file. I think this whole mess could've been avoided if the map was posted on Planetminecraft as a download as it makes things a Karzahni of a difference on how it handles map downloads. EDIT: Got it to work! Just needed to get some stuff to actually turn the files into a usable format. OK. so I've gotten the island to work. But, was the map supposed to contain the same island we were playing on in the Game Weekends? Because I'm not seeing any familiar land marks from the Game Nights. Are the cast members absolutely certain that they put the correct map up for down load? What landmarks do you mean? So, is this normal, I'm near where I spawned. That's... odd. Has anyone else had this issue? Excuse the interjection but on what version of minecraft did you load the map? also try going to the center of the map, AKA 0 coordinate. I am sure it was located somewhere within the island. 1.11.2 or 1.11.1. And I did click the link in Eljay's post, got it turned into a usable file format and put it with my other maps in my saves file in the .minecraft folder. So I have no idea in Karzahni why it's not working. I did and that was the main issue when I originally had issues-figuring out that I needed WinRAR and downloading it-but that's not the problem. I think there may have been that the wrong map was up for download. Then why did I get the result that I put in post 291? that's not my system. this is my system: Windows 10. and it's there in my saves file; I'd post an image but my laptop doesn't want to cooperate with my iPod. Stupid Devices, Work you stupid pieces of plastic and metal, Work!!!!! (the previous bit is referring to my devices) and I did get a RAR extraction app installed Komrad.